Team Nika bowman and pro sailor Giorgio Tortarolo tells us what it takes to get to the top of the fleet in one of Europe’s premier Melges 20 sailing series. The Melges 20 Winter Series was founded three years ago by Synergy Sailing Team owner Valentin Zavadnikov and the Yacht Club de Monaco. The event has quickly become one of the premier winter regattas in Europe drawing participants from Monaco, Italy, Sweden, Denmark, Poland, Turkey, Russia, and South Africa. Racing takes place over five events between November and March. The fourth event known as the Primo Cup marked the start of the 2016 European Sailing Series. Held Feb. 12 – 14, the Primo Cup was won by the Quantum-powered Anna, owned by Russian sailing federation president Vladimir Silkin. Indeed, Quantum boats took seven of the top ten places. The competition at the Primo Cup included some of the top European teams such as RC44 World Champion Vladimir Prosikin on Nika and 2014 champion Manfredi Vianini Tolomei on Maolca. After four events, Quantum boats own four of the top five spots on the overall leader board, with Alexander Ezhkov’s Pirogovo in first, Nika in second, Dmitry Samokhin’s Russia in third, and Igor Rytov’s Russian Bogatyrs in fifth. With one race to go, we caught up with pro sailor and Team Nika bowman Giorgio Tortarolo to find out what it takes to climb into the top of the Melges 20 fleet. 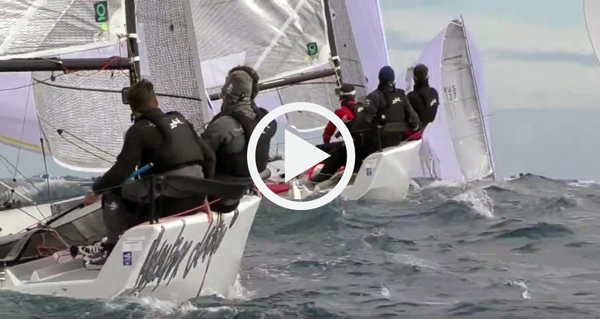 Quantum: What is the most challenging aspect of sailing the Melges 20? Giorgio Tortarolo: To sail against top sailors from all over the world with a strictly one design boat. Q: What is the most crucial aspect of light wind sailing on the Melges 20? G: The tuning of the mast is important, but also the movement of the crew weight. Q: Across the fleet at the Monaco Winter Series, where do you feel there are more gains to be made—upwind or downwind? G: Both are important. For sure upwind you can’t gain a lot of distance, but to be in the top helps to make strategic choices, while downwind driving the boat well means you could gain 200 meters against one that is not sailing well. Q: What benefits do the Quantum sails offer the Melges 20 in light wind conditions? And in heavy breeze? G: Quantum sails are really good with light to medium wind with choppy conditions. With strong wind I would like to have a sail less powerful with the draft forward. Q: The Melges 20 is touts itself as a well-built sportboat that’s simple to sail. How does that add to the difficulty or competitiveness of the fleet? G: The Melges 20 is perfect for having fun and sailing strong races. The level is really high, but with a good coaching even a lower-level team can improve fast their performance. Boat handling and tuning of the boat are crucial for making it to the top of the fleet. Q: What’s the most important aspect of Melges 20 sailing to master for newcomers hoping to be competitive in the fleet? G: As I said before, to have a member of the crew or a coach that knows the boat very well is crucial and the preparation of the boat and the tuning are also really important. The tuning guide that Quantum gives to the customer is very well done, so also this aspect can help the new team to learn fast. The battle will continue between Pirogovo, Nika, and the rest of the Melges 20 European fleet on March 18 – 20 in Monte Carlo. Follow the fleet on their Facebook page.